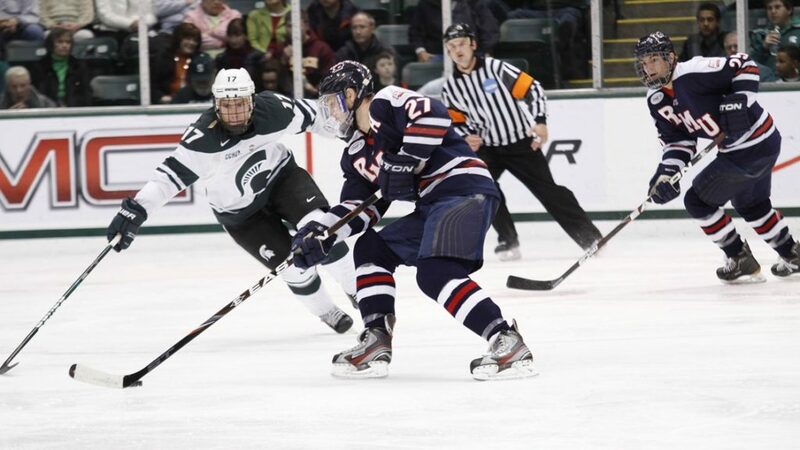 Brandon Blandina, a member of the Robert Morris hockey Class of 2012, is scheduled to make his NHL debut as a referee tonight at Madison Square Garden when the Rangers host the Red Wings. Blandina will become the second RMU alum to skate as an NHL referee, joining his classmate Furman South, who made his regular season NHL debut last season. Blandina, like South, is a success story from the NHL officals exposure combine, which will have its eighth session this summer. John Rey and Denny Urban are other former Colonials that attended the combine in past years. The program’s goal was to introduce former players with high-level experience to the officiating side of the game. The combine takes place in Buffalo every summer, and is clearly succeeding in its goal to develop NHL officials. Over his four years with the Colonials, Blandina tallied 37 points in 133 games. He also served as an alternate captain during his senior year. Blandina played two seasons of pro hockey after graduating from RMU, spending time with the ECHL’s Elmira Jackals and Reading Royals. According to his NHLOA bio, after playing he transitioned to other aspects of the game, training and coaching. He began a training program at RMU Island Sports Center and volunteered as a coach with Pens Elite. He then spent two years as a volunteer assistant with his alma mater. That is also when he got into officiating, gaining some experience in Pittsburgh-area games. He then attended the exposure combine in both 2017 and 2018, while progressing up the ranks of officiating, and was signed by the NHL this past summer. He has spent the season thus far officiating in the AHL, honing is skills and preparing for the highest level. The 27-year-old from Centennial, Colorado is expected to wear number 39 as an NHL referee. He is expected to ref his first game with Chris Lee, a veteran with over 1000 NHL games under his belt.